To stay up to date on the latest info for all future seminars you can subscribe to our newsletter here or follow us on Facebook here. Want to learn more about your pond or water feature? Then you should plan to attend some of our upcoming FREE educational seminars. These classroom seminars will take place on the following Saturdays from 9:00 - 9:30 am. No sign-up or reservation required. Call 303-744-3505 or email support@truepump.com for more information. Learn how to create a piece of paradise that will fit almost anywhere! This "hands-on" training session will show you how to build your very own fountainscape using the easy to install Aquascape AquaBasin. Seminar begins at 9:00 AM and working together we will create a beautiful, bubbling fountain by 11:00 AM. Class size is limited to 15 people so sign up today! Class is free but pre-registration is required. Register online or call 303-744-3505 or email support@truepump.com for more information. Sign up for our one day seminar and get your hands dirty! 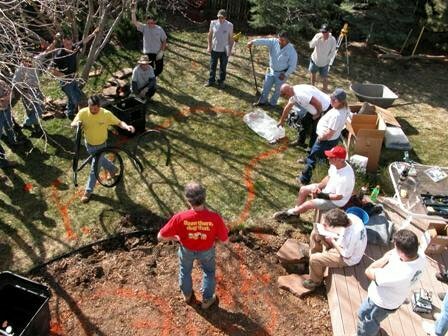 Learn how to create a paradise in your own backyard working side-by-side with the pros from True Pump! This unique "hands-on" training session will show you how to build a water feature as well as teach you the importance of a well balanced ecosystem. Seminar begins at 9:00 AM and working together we will create a beautiful 8' x 11' pond and waterfall by 4:00 PM. Class size is limited to 15 people so sign up today! Class fee is $30 and is fully refunded with the purchase of a pond kit within two weeks of the class. Lunch and beverages are provided. Sign up for our one day seminar and get your hands dirty! Learn how to create a paradise in your own backyard working side-by-side with the pros from True Pump! This unique "hands-on" training session will show you how to build your very own water feature. Seminar begins at 9:00 AM and working together we will create a beautiful pondless waterfall and stream by 4:00 PM. Class size is limited to 15 people so sign up today! Class fee is $30 and is fully refunded with the purchase of a pondless kit within two weeks of the class. Lunch and beverages are provided.